How would you interpret the fable of the doorkeeper, from Kafka’s “Trial”? What is its purpose, or meaning? I strongly believe the doorkeeper fable has different interpretations. The meaning I gave it was that sometimes even knowing exactly what we want, fear, insecurities, and opinions stops us. The man’s sole purpose was to get admittance to the law. When the doorkeeper says " It is possible, but not now." he gets the man’s attention since he manifests there exists the chance to go in. Then he mentions "Go ahead and try to enter despite my prohibition. But take note, I am powerful and I am the lowest of the doorkeepers." I believe this part is what makes the man fear to just try and go in. Also, The thought that it would be useless since the doorkeeper is powerful and there are others more powerful than him. Once he feared and did not see the point of even trying to just go in, he spends the rest of his life trying ways to convince the doorkeeper to let him in yet he never achieves it. I believe this fable shows us how sometimes knowing there is a chance to achieve something, fear, insecurities, or opinions stop us. He tried everything else and failed, the only thing he did not try was because he let someone convince him he would not be able to do it. I believe this has happened to many people including me. This fable shows us that in order to achieve our goals we need to believe in ourselves and not let anyone convince us we can’t do something since we can achieve anything we set our minds to. The way I interpret Kafka’s fable is that the idea of everyone being ‘the same’ in front of the law is an illusion. As mentioned in the fable the door is there specifically for the man, who spends his life trying to enter. Hence, the man is waiting for the doorkeepers’ allowance to see the law, even though the law should be accessible to any man at any time (as all people are said to be the same in front of the law). Up to now I haven’t figured out what exactly the doorkeepers meaning is, however, the way I’ve interpreted it is that the people guarding the law could be seen as the rich, as the elite. I have drawn this conclusion, as it is mentioned in the text that the doorkeeper is wearing a fur coat – something poor people couldn’t afford. Seeing it the way I do, access is prohibited to the law-seeking by the rich, as they have more power than regular people and therefore are able to change the rules. However, it also needs to be mentioned that flees lived in the fur coat of the doorkeeper, symbolizing that even the elite has its flaws. In the doorkeeper fable, the purpose of the fable is to show us that we are the man that is trying to get into the gate. The priest says how the gatekeeper could be in fact deceived. This is the part when you realize this fable is about life. We want all these things in life like staying young however we grow older every day, or even love while never finding it. Essentially there is no one way to do life the correct way, or one right path. So we as people want to find out how were supposed to live, a lot like how the man wants to walk through the door, we want to find out the right way to live, or the purpose of our life. Michael, this is a good attempt at building an argument in favour of a view on this issue, namely – that the fable is meant to symbolise life as such. Your main reason is that we want illusive things in life (like youth or love) and fail to get them, just like the man fails to get through the door. The argument could be strengthened some more. First, when you state your claim – "this is the part when you realise this fable is about life" and you link this with the priest saying that the gatekeeper could be deceived. This is where you’re not only unclear (what do you mean by the gatekeeper being deceived?) but also wrong. In fact, the text says "You fool yourself in the court" said the priest, "it talks about this self-deceit in the opening paragraphs to the law". So the priest talks about self-deceit – presumably that of the man — rather than deception by the doorkeeper. This is an important point. At any rate, you mention the link without explaining it. Second, you only use one reason — a good one, I grant you. But it is too little to build a strong argument. You must add others, and also work on your rhetorical skills (compare and contrast, use irony or metaphors) to build a convincing case. Finally, the conclusion. You repeat the claim from the beginning, but this does not clearly follow from your reason(s). How or why is the image of the man trying to get through the door conclusive with respect to our failure to find ‘the right way to live, or the purpose of our life’? Quite a few things to reflect on. But a good start in practicing your critical skills. "Do we have a moral duty to always tell the truth, or is it sometimes morally justifiable to leave it unsaid, conceal it or even tell a lie?" There are two beliefs that justify this. One is Immanuel Kant, where he believes that there is only "absolute truth" where there is a rule where when you break the rule you are wrong hence a lie is a lie. On the other hand, Jeremy Bentham believes that there is a grey area in the middle between telling the truth and telling a lie. In that grey area you are allowed to lie to a certain extent while also measuring its consequences at the same time. This is called "consequentialism". In elaborating this belief, if you are aiming to protect someone with a lie ("white lie") , it is acceptable. For example, a teacher’s aim is to guide students to get a good grade and be smarter, not just follow a rulebook where it does not help students to grow. I believe that the doorkeeper should guide the person through its questions by giving clearer hints and also not concealing the truth behind him. Joshua, this is a good attempt to build an argument. You start with a question, identify two possible answers to it, and end with a personal view on the issue. My question to you is this: why limit yourself (two two philosophers)? Also, a word of caution here: when you refer to other people’s views, it is good practice to quote them (using primary literature, that is their own books) in order to avoid the risk of using approximate secondary interpretations of what they actually said. What you say is only approximately right – meaning, for instance, that ‘consequentialism’ is much more than the view that one is allowed to lie if it leads to more good than bad. Secondly, your example with the teacher — which is key to your argument, because it is meant to express your own view vis-a-vis the two philosophers’ — is unclear, both with respect to what you consider it to be an example of (the view that white lies are acceptable? how so?) and with respect to the actual conclusion. How is the idea that a teacher should help students grow (not just get good grades) related to the role of the doorkeeper in the fable? You need to be more explicit about your assumptions and the way in which your reasons lead to your conclusion. But otherwise, it is a good start. I personally think the fable of the doorkeeper is trying to illustrate how a person creates their own obstacles in the path towards a goal or end-point, and as a result the obstacle can only be removed by the creator him/herself. In the fable, the doorkeeper appears as the man is about to enter the place of law and only leaves as the man is about to die. The doorkeeper signifies the restrictions or morale that each person comes to shape their lives. The saying ‘you are the only thing that is holding yourself back’ represents this idea. The law signifies society, or a hierarchical order where a person may create these restrictions and guidelines. Would the man have met another doorkeeper in another form like an innkeeper for example, if he was going somewhere else. For example, a person enter a cathedral with a sense of respect for the environment and would in return, keep quiet; while on the other hand, if the same person was to enter a bar, the level of restriction is vastly different. Everyone reacts differently to environments and situations based on past experiences and beliefs; the obstacle is also created this way. As a whole, I believe the core idea of the fable is that depending on the location or circumstances, we sometimes create illusions of hardships that is preventing ourselves from progressing onto a goal or destination. The priest told K. this fable to make K. understand that only K. himself have the power to get past the obstacle. Alyssa, this is a pretty strong case. You make your claim from the outset – about the fable referring to the fact that we are responsible for the obstacles we put on our way to our goals; then you support it with inter-connected reasons (namely, various elements of the fable and what they ‘signify’ in the context of this interpretation); and then you show how these lead to your conclusion. This is a good structure. Ways in which you could further strengthen your argument are – first, you should be more specific about the "obstacles" that the man in the fable creates for himself. What ‘restrictions’ or social ‘guidelines’ is he obeying? And how could he overcome these? What exactly should he have done to ‘get past the obstacle’? Make it more concrete, and it will strengthen your argument. Second, consider using an intermediate conclusion, to focus your general argument towards the more specific case here. For instance, you could say ‘in some cases, the obstacle is an illusion, and all we have to do is free our mind of it’. Then, proceed to explain how this would apply to the story. The man imagines the doorkeeper to be more powerful than he is; he imagines other doors and other doorkeepers coming after him etc. Third, work on your rhetorical style. Try to use figures of speech, like rhetorical questions (like "Have you ever seen ‘the Law’, and does It really look that scary? "), or irony, or metaphors, or something to make your case more attractive (that is, more persuasive). But what an excellent start – well done. The doorkeeper fable was intended to show the importance of being able to consider all possibilites in life, by means of questioning and trial and error for yourself rather than blindly accepting other’s truths. 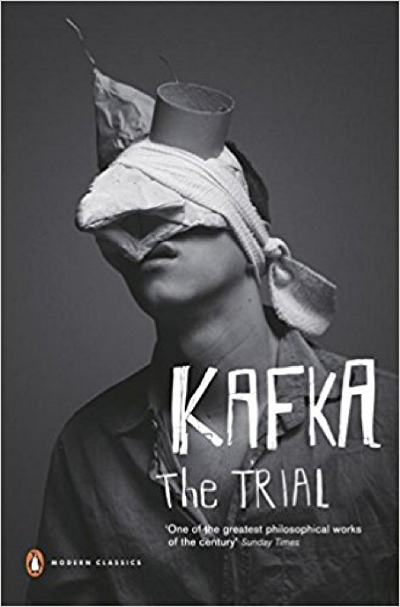 For instance the priest in The Trial, states, "…you do not have to consider everything true, you merely have to consider it necessary" (Kafka, 203). This allows for a wholistic view of the world and prevents you from sustaining a previously biased opinion or school of thought. However, you may be able to understand why such opinions may exist. Another idea presented in this fable is that what is a limitation to others is not alyways a limitation to yourself. Thus strengthening the idea that you must question and perform your own personal trial and error before blindly accepting someone else’s insecurities and incapabilities. For instance the Doorkeeper attempts to scare the man with what he fears most. The man allowed the idea of obstacles to shackle him to the door and the doorkeeper. Therefore the idea that obstacles only exist within the mind and free will is an option is presented within the fable. Yasmine, you’re in a flow of consciousness that needs channeling through. You have several good ideas, but now you need to organise them to build one case – on a particular claim. To do this, you need to: a) clarify your claim (what is the view you want to put forth); b) find a number of reasons to support it; c) work on your (rhetorical) style, to strengthen your case; and d) carefully build your conclusion(s), which must clearly derive from your reasons. Your claim is not entirely clear. It seems to be related to the quote you provide. But you need to be 100% clear about the view you’re trying to put forth. Your reasons are also only partially clear. For instance, how is the idea that others’ limitations are not necessarily your own linked with the claim you’re trying to support? It is a perfectly valid idea, but you don’t get the most out of it, because you don’t clarify its role in your line of arguments. The same goes for the idea that you must undertake your own trial and error – for what, exactly? And how is this linked with the distinction between true and necessary? (I’m not saying it isn’t, I’m saying you’re not making the link explicit, so it loses some of its potential as a strong reason in your argument). Finally, your conclusion is unclear – at best, and missing – at worst. You say that "obstacles only exist in the mind and free will is an option". These are two distinct ideas, and none of them flows clearly from your reasons. You have a lot of ideas – your mind is very active; learn to control it, work with your ideas, don’t just let them flow. Firstly, I simply get an impression of the doorkeeper is a metaphor of the priest and the man in this fable is K. The priest perhaps emphasizes he (or the court) is Law that K is facing now, and suggests him there is an option he might be able to choose. I think the doorkeeper is a metaphor of intellect and the Law is strict rule which a human is thinking all the time unconsciously. Each hall in the Law represents a blind belief when a human strongly believes that he or she must follow the rule whether the rule is right or wrong. I believe, entering the hall is not forbidden but going out is forbidden because it means you break the Law you chose and you must pay a penalty fee to the doorkeeper who can also be a metaphor of feeling guilty towards the person’s real intention. Both, protecting a rule and breaking the rule must be stressful. The fable might represent ‘irritation’ and ‘unreasonable feeling’ of human being , as the man in this fable beg and wait for opening the door until his life ends. It might suggest that Kafka wanted to show disgusted feeling towards slump and feeling of cannot ask a help to others. The fable clearly points out there is a choice you can choose; simply leave the Law and go anywhere the man wants. Going back to the story of The Trial, K is represented as a man who cannot think objectively and persists in own opinion only. The priest, and the court might wanted K to clarify he has a strong will to live and recognize the Law can easily take away human life. Kiara, you have a few strong reasons here, in your argument – and a partial conclusion (by partial, I mean ‘possible but unclear’). What is entirely missing is a clear claim (or point of view) at the beginning, which clarifies what is the key idea you’d like to put forth, what point of view is your argument meant to support. From the reasons and examples you give, I think your claim might be that the fable can be interpreted as a symbol of all mental (and moral) restrictions that we tend to impose on ourselves. But you don’t state this clearly, so I am only guessing. Your reasons are: (a) the doorkeeper is a symbol of our intellect, which subconsciously imposes restrictions on ourselves; (b) there are ‘corridors’ in the court of law, which symbolise the multiple norms or rules that we believe we must blindly obey; (c) if you break any of these rules, you feel guilty and you must ‘pay a fee’ – this is an interesting idea, but it’s not in the fable (so you should state it more clearly as your own); (d) the more he waits, the more stressed, tired, or disgusted the man becomes (faced with his own failure to get past the door? ), which is a symptom of the oppression of the Law understood this way, as the self-imposed restrictions in our life; (e) there is always a choice – we just need to decide to take it; all we need is determination, or a strong will, as you say. These are all very good reasons – but you don’t explicitly clarify them, I sometimes have to guess what you mean. So, work on your style – try to be as clear as you can. Overall, well done. I can see the effort you made to look for several reasons, in support of your argument. Now, you need to clarify both your claim and each of these reasons. And at the end – show how exactly they lead to your conclusion. I think the fable circles around the idea that the obstacles a person may encounter in life is sometimes created by him/her self. The doorkeeper only blocks the man from entering, but he is only the when the man is there. The law symbolises society and the doorkeeper symbolises a rule that the man imposed upon himself. This is why the doorkeeper left when the man died; one could interpret this as the man letting go of his constricts at the last moments of his life. I believe the purpose of this fable is describe the balance between self, regulations, and society. One must realise the regulations imposed upon oneself in order to meet/merge into society’s standards and expectations. The priest told K this story because he wants K to realise that the obstacle is K himself. Aha, so this was your first attempt. I’m glad it didn’t get through to me from the start, because your second attempt is much better (both stronger and clearer). Well done to persevere, Alyssa. The fable of the door-keeper suggests many issues: Firstly, a person should not put complete store into one fate or overly focus on one outcome to his life – particularly when that outcome is dictated by others. The man has an ‘insatiable’ focus on near-sighted objectives (getting through the first door) without considering the consequences of a) not getting through the door and b) whether he can get through further doors when additional door-keepers are more formidable. This suggest the man should not seek the first and most obvious solution to a long-term plan at the expense of other objectives in life when the first objective is so unassailable – it also suggest the futility of seeking meaning to the man’s existence. The story also hints at the futility of gaining access to ‘the law’ which seems unnecessarily tortuously complex, without benefits to enter but is irrationally desired. The issue is further complicated by the door-keeping being an unreliable ‘advisor.’ He, without pity, gives no clear indication when the man can pass but the man clearly believes he can at some stage, selling his possessions, ‘no matter how valuable’ and relentlessly questioning the door keeper to gain entry. Having no success and constantly questioning the man to gain entry to a world of deeper but unknown meaning, indicates a warning against the single-mindedness of being preoccupied with an objective whose value is unclear. The story is a parable of the pointlessness of unjustified determination and hope, particularly, when the truth is only ultimately revealed at the point of the man’s death. The central insane paradox is the man could not pass through a door through which only he could pass suggesting the pointlessness of keeping to life’s or the law’s rules. Joseph, you point out various ideas from the fable, without 100% clarifying what point of view you’d like to use them to support – what is your central claim? This should be announced from the beginning, and then mirrored by the conclusion at the end, which should clearly derive from the various reasons you invoke. Also, try to be clear in the way you formulate your reasons. For instance, what do you mean by "a person should not put complete store into one fate"? Or by "an outcome which is dictated by others"? How are these specifically related to the fable? Is the man’s attempt to go through the door dictated by others – and if so, who are these others? And why do you think the man’s aim to get through the door is "unassailable"? Are there any real obstacles that prevent him from getting through? Maybe the obstacle is in his mind – maybe he is just intimidated by the doorkeeper. Maybe he just imagines the other doors. You try to derive a conclusion about "the pointlessness of unjustified determination and hope". But this does not follow clearly from your line of arguments, because you haven’t exhausted all the possibilities. You haven’t considered the possibility that the man should have simply tried to pass through the door, instead of keep asking questions and talking to the doorkeeper. I’m not convinced the hope is pointless, or that his determination is strong enough. You’ve got to (a) be clearer about your claim and your reasons, and (b) follow your line of arguments through, don’t leave anything hanging. However, a good start, well done! The fable of a doorkeeper confirms K.’s suspicion that everything in the court is built on corruption, and that he should try and ignore the trial, however, the priest offers multiple interpretations of the parable. I believe that the doorkeeper can be viewed as a positive force – the law, as he tries to protect the man from entering and facing harder challenges on his way (other guards). The doorkeeper also hints that the man is not ready to enter the door yet, and his time will come, putting himself in a very selfless position as he cannot leave his job while the man is there, therefore, making himself stay there without complaining for all these years. And as we find out at the end, the door was meant only for this country man, so the doorkeeper knew all along that nobody else will show up if he was to send this man away or just let him in and let him deal with all the challenges on his own. Therefore, a doorkeeper cannot be criticised as he is the representation of the law, something that can’t be judged and just has to be obeyed instead. The priest also makes it clear that the man doesn’t argue with the doorkeeper, doesn’t make any attempts to enter, but just waits patiently for the permission his whole life. Katherine, you have a clear way of expressing your claims and reasons, which is very important. Now, you need to work on the logical structure of the argument. You say that the doorkeeper can be viewed as a positive force (protecting the man from future challenges) but then he reveals that the door was for him, rightly suggesting that the man should have found the courage to get through. The two are contradictory. The second is closer to the true message of the fable, and supported (as you say) by what the priest says. Make sure to break your argument down into reasons and double-check that they logically flow from each other. Thank you for your reply! I strongly believe that those don’t contradict as, yes the door was meant for only this one man, however, he was suppose to discover for himself that the door was meant for him and go through the whole process of waiting and becoming more humble as the time goes. Therefore, i think that the doorkeeper is a positive force, since he not only loses his life waiting out until the man reaches the point where he can enter the door, but also keeps quiet thought, to let him understand that it is up to him to try or ask questions, instead of sending him away or lying about the purpose of the door or of his existence there. No one meaning of the doorkeeper fable can be agreed upon. Some argue the fable is about deception between the doorkeeper and the man. On the contrary, I believe it has a deeper meaning of taking your life into your own hands. The man does many things in order to get to the law and specifically the door. He begs the doorkeeper, questions the doorkeeper, and even waits his whole life. The one thing he did not do though, was to try and get through the door. He simply let the doorkeeper set the guidelines. He ends up waiting a lifetime for something he never even attempts to get. He lets another control his fate and never takes matters into his own hands leading to failure at achieving his goal. Samantha, your argument is clear and strong – albeit short. Your key claim is very clear, and your reasons for it strong. Well done. The only weakness here is your opening sentence: "No one meaning of the doorkeeper fable can be agreed upon" is a weak generalisation. Someone could easily contradict you by saying – actually we completely agree with your interpretation, and we now others who do as well, so one dominant meaning can be agreed upon. Try to avoid such generalisations. You could replace them with something more humble – or open – like "The doorkeeper fable can be interpreted in multiple ways". On this, it would be much more difficult to contradict you.